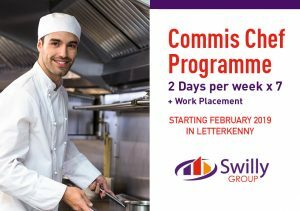 Swilly Group are delighted to announce that we are delivering our hugely successful Commis Chef prgoramme again this February. We are now now actively recruiting for the Programme which is set to start on the 25th February. This short (part time) hospitality programme is delivered over 7 tutor led weeks (2 days per week) and 15 days of practical work experience. The practical ‘hand on’ approach is designed to enable learners to develop basic kitchen skills and cooking techniques that will assist them in taking up employment in a Kitchen environment within the duration of the progamme. Practical meal service skills will also be developed as part of the training. The programme is fully funded by Tech NorthWest Skillnets in order to assist participants progress into part time/ full time employment positions. This is an introductory level programme. Previous experience in Hospitality or Catering is not essential, but a passion for cooking is ! All participants will be provided with a basic Chefs Uniform as well as a basic set of kitchen knives. Students will be assisted in securing a suitable work placement host company, if they need assistance. An Information Session on the programme will take place at the Swilly Group (Business Park Road, Letterkenny, Co. Donegal) on Wednesday 20th February at 11 am for all interested parties. Should there be more applicants than places interviews will take place following the Information session. The course is due to start the following Monday, 25th February. The course is provided free of charge to all successful applicants. To book at place at the information session please email Susan at susan@swillygroup.com or call (074) 91 51212. In order to put your name forward for the programme it is mandatory to attend the pre-course information session.